All the excitement of warm, sunny days, big blue beaches, chlorinated swimming pools and the smells of coconut suntan lotion come flooding back to our memory banks after a long winter has finally ended. A time when we bring out the flip-flops, the tank tops and the BBQ’s, and let the fun times begin. That’s what this recipe did for me on the cold, wintery night I made it. Good thing I had my memories to warm me or I might have darn well froze to death! Yes, I’m a California girl. So all you have to do is hold an ice cube within 10 feet of me and I swear I’m going to die from hypothermia, but still. Plus, this was an easy dish for my frozen fingers to make, and I got to stand next to a warm stove while I was doing all that day dreaming. So it was a win-win. For these sloppy joe's, I used the Alvarado Street Bakery brand burger buns. Fantastic flavor, and clean! Put your olive oil in a large pan, add the turkey meat and cook over medium heat. Once the meat is cooked, add everything else. Stir until well blended and heated through. Scoop however much you want onto a clean hamburger bun and "get sloppy with that Joe!" My summer favorites include running and spending weekends outside. Summer is also the time for my husband’s family annual vacation at the Lake. I love going, I really enjoy cooking so its a great time to cook for a huge group of people. My niece and nephew are lactose intolerant, so this year I’m going to make the Orangesicle Banana Ice Cream for them since they can not partake in the Ice Cream night on vacation. One of my absolute favorite summertime activities is berry picking! It gets a little hot during blueberry season, but I just LOVE the whole experience! I love the smell of the earth after in rains in the late afternoon, especially when the sun pokes itself out just in time for the sunset. Wait, wait I’m not done and then…the fireflies start their show. “Summerdusk” in Sweet Home AL. I absolutely love it. There is no place like home. ps I tweeted the contest and thanks for all your recipes. Gracious Pantry is one of my favorite twitter feeds contest or no contest. My favorite summer time meal is brats and corn on the cob. Since changing up my diet a bit, I generally go for turkey brats, but they have been difficult to find since moving to the East coast. I know, not exactly clean, but what can I say? I’m a good little Wisconsin girl. 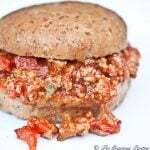 My husband loves the canned Sloppy Joe mix but I hate it taste wise plus it is not clean. Thank you for this alturnative. Summer for me… is memories; running through the sprinkler while my dad grilled burgers for all us (5) kids, my mom sitting on the patio watching us and dad while our black lab ran and barked along side of us. Our neighbor calling one of us over to hand a basket of fresh picked sweet corn over the fence, and one of the neighborhood kids coming by to make sure we were all “in” for the epic-long nightly “kick the can” game…and the discussions on whose backyard we would play it in! Packing our pool bags everyday(don’t forget your swim cap, towel and your pin on badge) and meeting up with bunches of our neighborhood friends to walk, in our Dr Scholl’s sandals, through the woods to “the pool” (CC) together, where even more of our friends waited! How I miss the simple, hot, long days of summers past! What are your summer favorites? Hikes in the Colorado mtns, swimming, the creek! What gets the fun started for you? We start our summer out when the snocone machine gets cleaned up and out. ****I need clean marachino cherries….and clean snocone syrup recipe. What’s your favorite summer-time memory? The pool with my friends. PS What buns do you use? those look delish! my favorite summer time activity is going on long bike rides; my fave foods are grilled fish and veggies; looking for more flourless recipes, trying to stay away from flour and sugar as much as possible. your sloppy jo recipe looks amazing. My favorite summer time memory would probably have to be going to lake Powell with my family. And the sloppy Joe recipe looks great! I love warm weather, sun, swimming, the beach and getting to spend more time with the kids! My favorite summertime food is ice cream, especially when my inlaws make homemade for their streets 4th of July block party. My favorite summertime memories are swimming all day long in my parents pool as a kid and going to the beach with a big bunch of family in the summer. One of my favorite memories is camping with my family. Now it’s fun to take my own boys back to those campsites and make new memories. My favorite summer memory is my beach vacation with my nephews last year to Ocean City, Maryland. My favorite summer-time food is all the bounty of produce in season then! I love organic strawberries, raspberries, blueberries, peaches, and plums, and enjoy conventionally grown kiwi, watermelon and cantaloupe (those thicker skins prevent more pesticides and other toxins from leaching into the flesh). For veggies, you just can’t beat the flavor of organic and locally grown cucumbers, tomatoes, corn, green beans, eggplant and summer squash! Whether raw, steamed, grilled or sauteed with a little fruit juice or veggie broth, seasonal fruits and veggies give me the energy and nourishment my body, mind and spirit need to sustain me in all that life brings to my table. May life bring all good things (and good foods) to your table. Shared the recipe on Facebook too! oh my gosh Tiffany, you couldn’t have offered a better contest at a better time! Summer for me is about warmth, sunny bbq’s in the back yard, longer nights to go the park and fresh fruit. I grew up with a pool so family bbq’s with watermelon always makes me smile! Thanks for the warm post! One of my favorite summer time activites is packing up the family and heading up to the montains for some camping. I will do my best to make our camping meals clean eating. One of my favorite summertime activities is gardening and taking bike rides with my family. We love going to the local farmer’s markets and grabbing whatever is in season! I will try grilling anything (eggplant and zucchini are my personal favorites). I love grilling so much that I’ve been known to be out there in the freezing cold of winter with a jacket and pair of BBQ tongs : ) Right now my “go to” salad is thinly sliced radishes, halved grape tomatoes, fresh chives from my herb bed, a splash of balsamic vinegar and EVOO, seasoned with a little black pepper. My favorite thing to do is go boating in the summer. My dh is an avid boater and it’s something the whole family enjoys. We also water ski and are in a water ski club. Fun by all! Thanks for all the wonderful, healthy recipes! You are AMAZING!!!! I love swimming in the summer. It is a little hard to do now since I have a 2 year old. My husband and I each take turns being with her so the other can get in 10-15 minutes a time of quality swimming alone. I have made the Clean Eating Mag. version of the Sloppy Joes. Delish! Honestly, my favorite summer recipe is one from my childhood summer’s at my Grandma’s. She would make cucumbers and onions with vinegar and sugar. Hmmm… I wonder how well Agave and Vinegar will mix?? @Crystal Moore: I do get the magazine…I’ll have to check it out. Love me some brats! My favorite summer time food is watermelon! This was the one food I could eat during both my pregnancies that would stay down and keep me full! My summer favorite is going for a walk with my kids after dinner or taking them to the pool. I love the sounds of summer sitting by the sliding door while it is open the day sounds alive. Summer favorite food is WATERMELON YUM!!!!! Favorite childhood memory is spending endless days at the pool when visiting my aunt for the summer!!! Hooray for sloppy joes! I have a freezer full of ground deer meat, and I am always looking for great recipes to use it in. I am tired of making tacos and spaghetti. Thanks for the great idea! I’ve already added this to my meal plan for this week. My favorite summer time activities…my kid’s swim meets, 4th of July fireworks, beach time, relaxing summer evenings at the pool w/ the fam. Favorite summer time food…fresh picked veggies from the garden. My all time favorite summer food is watermelon. It’s Perfect for those hot summer days! And for kristy- you cam totally clean up strawberry shortcake use tiffany’s recipe for angel food cake and clean whipped cream add strawberries and it’s done! Favorite summer food: grilled foods!! (grilled chicken, grilled veggies) fresh garden tomatoes and cucumbers and corn on the cob!!! AND watermelon for dessert…this IS summer for me!! 🙂 If I don’t get to eat these things regularly, it just doesn’t feel like summer!! We love camping in the summer! We have the most fun trying new concoctions in or over the campfire. Last summer we had one that we halved an orange and scooped out the middle (and ate while cooking). We filled one half with an egg and the other with muffin batter (I used a Tosca Reno :)), wrapped in foil and placed in the coals. It turned out great and the kids had fun! We’re leaving for our first outting tonight! Just the other day I was telling my husband that I wanted that feeling of being out in the sun, with the smell of pool water lingering on my skin. I have a distinct memory of me and my best friends spending a day out in the sun by the pool eating cold orange slices and crunching on ice from the cooler. Simple pleasures during a simple time in my life. Now the pool is a pernicious place full of potential dangers for our three under four brood. The last time we took them out to the pool it was stressful!!! I never would have thought that a day let alone 30 minutes by the pool could be so stress inducing. Sometimes, I long for those simple times. What are your summer favorites? Swimming? Beaches? BBQ’s? What gets the fun started for you? ~Tip-toeing through the house with a cup of tea and out to the backyard to sit in the morning sun with my wonderful husband before any of the kids wake up =) Absolute favorite feeling!! I “LIKE” this post on Face Book!!! my favorite summertime food is -fruit bowl. I know it sounds simple, but the fruit in summer is so much better than the flown in from god knows where type in the winter months. I love to be outside and have a huge bowl of cut up melon,grapes,strawberrys etc… its also thirst quenching. I liked this page on facebook too! We spend a lot of time on the road every summer going to Junior Rodeos with my daughter. I’ve been going through your recipes for things that will travel well. THANKS! WHAT gets summer started for me… is leaving my wonderful house in the busy city…and packing up the car with hubby and 2 boys and going camping..no computers..cell phones… just me and my GUYS chilling and enjoying the fishing..campfire..and oh so yummy SMORES!!! Living in the frozen tundra of WI it is very exciting to have locally grown fresh berries. Love to pick them with my kids and make all sorts of recipes! I know that summertime has officially started when all of the farmer’s markets start selling all of their spring and summer produce and the veggies start popping up in the garden. I absolutely LOVE to cook with fresh produce…fruits, veggies, herbs…you name it, I love it! I have an beautiful herb garden and this year planted a huge veggie garden. Seeing all of the stuff that I planted from seed sprouting out of the ground is so exciting! I’ll soon be harvesting my first batch of lettuces and can hardly wait! It’s officially summer! I RETWEETED 🙂 and FB Shared!! My favorite summertime activites are reading trashy novels while drinking ice cold beer and hanging out with my 2 daughters in our yard. These activities do not always occur at the same time but I will admit that sometimes they do : ) Looking forward to enjoying my husband’s first attempt at homemade beer this summer!! Favorote summer foods have to be fresh jersey corn and jersey tomato salad with lots of basil and red onion. I FB shared and emailed my special contacts this recipe and told them about your great site. My summer memories bring back wonderful thoughts. I grew up in the suburbs of NY and had a great big yard with an above ground swimming pool. I spent all summer swimming, having bbqs on an old fashioned charcoal grill, eating with the flies in the way and just having healthy kid fun. I always had friends over and mom was like a camp counselor! As I aged and learned to drive, my friends and I headed to the beaches and worked on our tans! As a married adult, we spend the summers traveling and, now living here on the Calif coast, we still visit the beach, but too cold to swim in it, and take our son on trips. I do miss my youth, and the good ol’ days! OOPs, I forgot to tell you my favorite food for summer—it’s watermelon! It reminds me of those yard days as a kid. Back then I ate meat burgers and homemade potato salad–mom’s specialty. No meat now and I haven’t made the potato salad, yet. What is your favorite summer-time food? Ice cream – which I have cleaned up by mixing plain greek yogurt with Stevia and cocoa or any fruits and freezing for an hour. SOOO GOOD! What’s your favorite summer-time memory? Bushhogging the fields with my grandfather and feeding the cows. Yeehaw! I simply LOVE eating fresh corn on the cob (bought from Amish neighbors) on the deck on summer evenings…preferably followed up by some watermelon. Nothing better. My favorite summertime memory from the past was camping with my dad and brothers. My new favorite summertime activity is playing at the beach with my children. The beaches are rocky in Washington State, but there is one man-made beach, Jetty Island, which has REAL sand! Fun, fun, fun! My favorite summer memory is swimming at my grandparents’ pond with all my cousins. Thanks for offering the give away! My summertime favorite is camping. I live in WA state and we have the best camping available…beach, mountain, lake, and river. Love to camp in any of those settings as there is so much to do when you camp such as hiking, biking, fishing, swimming, rock collecting, sand castle building, kite flying, enjoying the camp fire and best of all spending time with your family. My favorite thing to do is grill out while the kids play in the sprinkler! I’m from Canada and know that i can’t win, but i’d still like to participate. I want to Give you the Biggest Hug!!! You have inspired me to eat clean through your recipes!!! I love trying new and exciting things… I havent made anything that i havent loved of yours!!! We have been struggling with infertility which has been a huge stressor!!! so the extra weight hasnt helped either… So your wise words about how hard it is being sick than healthy, really got to me! and Its so true!!! Thank-you from my heart!!!! I love reading all your different posts!!! You are a very inspiring woman!!! Marie – Awwwe, thank you! What a wonderful comment! I so appreciate having you as a reader, and I’m happy you are enjoying my recipes! Every summer for me was spent outside in a swimsuit all summer. Whether it be for swim meets, at the farm, or at my house. Playing in the rain has always been a favorite especially in a swimsuit. One year it opened up and hailed followed by a rainbow. I really miss my swimsuit days and someday maybe get back to it, lol! That is my favorite memory of summer! Summertime – sunshine and swimming. There is nothing like it. I love spending time with my children and grandchildren and sharing good (and clean) food, playing games, taking pictures. Going to try the Sloppy Joe recipe tonight. Sounds good. I used to hate summer time…because I was fat and didnt want to be seen in cute dresses or a bathing suit. This year I couldnt be happier for summer to be here! I am down almost 80 pounds..still have a ways to go! With all that being said my favorite things to do this summer will be all outside activites! Playing outside with my daughter, doing side walk chalk, blowing bubbles, going to the pool every day and the park! I even got a Nashville Shores Waterpark pass because I feel comfortable in a bathing suit and cant wait to be doing somethin fun at the pool with my daughter! I cant wait to try all of the clean eating recipes off of your site! Our cook outs were full of fatty and unhealthy foods! This year they will be healthy and delicious foods! My favorite place to go in the summer is the Farmers Market to get fresh and organic fruits and veggies! My favorite thing to eat in the summer is grilled zucchini and squash and of course a big juicy tomato! Looking forward to making a clean eating pasta salad too! I love your site and make at least 5 to 10 things from it every week! YOU ROCK TIFFANY! Well my summer is going to be a busy one I hope. School just got out so now the planning starts for the little one. In a couple of weeks she gets to do basketball camp and hopefully it will warm up soon so we can go to the pool. We get to go see the inlaws and do the fun things that come with that. It is also is the start of on the weekends sitting around with good freinds with good food and maybe some good drinks every once in awhile. Hope to have fun and get to do some great things that we don’t get to do all the time. I like to eat a nice juicy peach and going to fishing!! My all-time favorite thing to do in the summer is to take the belly boats out to one of the reservoirs near Sheridan (WY) and go fishing with the kids and grandkids. It’s especially exciting when the little ones catch a fish! And then we clean them, cook them and have a picnic. My favorite summer-time memory is hanging out at home with my sister & mom all summer long and doing NOTHING! The summer seemed to stretch forever….oh, to have the timeless lifestyle of childhood again! What do I love about summer??? HOT TEMPS (80s and 90s, with occasional 100s) and SUNSHINE!!! I love days at the lake — using the Waverunner and waterskiing. I also love the early morning sunrises …. I love being able to take my runs outside at 6AM, while my family is still sleeping. Even if I have a long run (1-1/2 to 2 hours), I’m done early, and I have the whole rest of the day to spend with my family!!! The smell of the grill and the sound of kids giggling in the sprinkler is synonymous to summer for me:) Love the clean eating sloppy Joe inspiration….yummy!! Summer means no school so lazy days! I love to chane my routine by eating fresh fruits and vegetables and working out in the morning! I love sitting on the screened porch watching the birds (especially the hummingbird), reading and doing my crafts! My favorite summer foods are Jersey corn on the cob and tomatoes. My favorite summer memories include playing outside all day on the swings and riding bikes. Now my time in the sun is limited due to getting burned way too fast! I am an Aussie girl, so like you I suffer so bad in Winter, which we are heading towards now, so those sloppy joes will definitely be on the menu! I am a beach girl through and through, I love getting into the water, I surf, snorkel and swim my way thought the entire year (thank goodness for wetsuits!). But my favourite thing is taking my little boy to the beach, he definitely picked up the merman gene from me because the look of absolute joy when he sees the water is priceless :). My favorite summer food is sweet cherries, and my favorite summer past time is reading on the beach. Oh, and I liked this post on Facebook. Cook until tender and serve over whole-wheat or sprouted wheat hamburger buns. What is your favorite summer-time food? My fav summer- time food is strawberry shortcake and watermelon. I shared this on Facebook. I’m Rebecca Anne on FB. Cait – You’re welcome! Hope you enjoy them! I like to use sloppy joes to disquise veggies as well. I throw in whatever I have available, but always use onions, peppers, and garlic. I also make a sloppy joe corn bread bake with a little cheese between the sloppy joes and cornbread to make it stick. My boys love it. Just make your sloppy joes and put it in a pan (use a pan depending on how much sloppy you make) and then put a thin layer of cheese (I use cheddar, not sure how clean that is) then put the corn bread on top. Bake for 15-18 minutes until corn bread is golden. I am going to try it tonight with your cornbread recipe, modified to fit what I have on hand. Thanks! Stephanie – I’ve always wanted to try that! Let me know how it turns out! Sabrina – Welcome! I’m so happy you enjoyed it! CEC – Wonderful! Thanks for letting me know! Why thank you! That’s quite a compliment! Just tried this! Love it!! My pleasure! I’m glad you’re enjoying them! This was the first clean eating recipe I have tryed ,and I loved it! Samantha – Fantastic!! 😀 I’m so happy you liked it! I have made this recipe twice and LOVE it (so does the family)!!! I am surprised how long the clean ketchup I made with your recipe has lasted without spoiling! It’s been 3 weeks and still smells fine.